Ben Bishop didn’t have a leg to stand on. Literally. At various points during last night’s Game 3 of the Stanley Cup final in Chicago, Bishop struggled just to stand up. At other points, he made it seem like going side-to-side was difficult. And yet he somehow stuck around for the entire game, eventually earning the decision in Tampa Bay’s 3-2 win. As painful as it was to watch, last night was an improvement. On Saturday, Bishop’s mysterious injury forced him out of Game 2 — he briefly returned and then left again, this time for good. Backup Andrei Vasilevskiy was forced into action in the game’s final minutes. At this point, it wouldn’t be a surprise if we see him again this series. Bishop is toughing it out, but he looks like a guy who is on borrowed time. And so, we find ourselves playing out a story line that’s exceedingly rare in a Stanley Cup final. For the first time in almost a decade, we have a starting goaltender suffering a significant mid-series injury, one that has already forced him out of action once and could do so again. Uh, you might want to stop reading right here, Oilers fans. Seriously, just do it. Close the browser tab. Everything is going so well for you right now. Between Connor McDavid, Peter Chiarelli, and Todd McLellan, you’ve basically just enjoyed the best month any team could have without actually playing any games. Life is good for you right now. So stop reading. Because today, in the aftermath of the Bishop ordeal, we’re going to look back at the last time an established starter got hurt during the final. And that means going back to 2006 and the series between the Oilers and Hurricanes. The 2006 Cup final was the first played in two years, thanks to the lockout that wiped out the entire 2004-05 season. 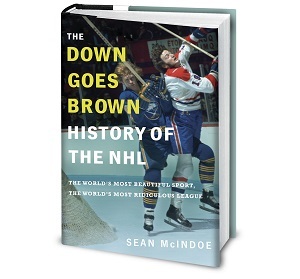 When play finally resumed in October 2005, hockey fans were treated to a league with a new salary cap, new rules, and a new emphasis on calling the rulebook by the letter. The result was the best kind of chaos, a season when conventional wisdom and expert predictions went out the window. Scoring jumped, two generational talents debuted, and the eventual MVP was traded midseason. It was a fun time. That sense of unpredictability carried over into the playoffs. In the East, the Hurricanes ultimately edged the Sabres, which wasn’t especially surprising. But in the West, where the heavily favored Red Wings had racked up 124 points to emerge as the clear-cut Cup favorite, all four underdogs won in the opening round. After beating Detroit, the Oilers made an unprecedented run all the way to the final as the no. 8 seed, knocking off the Sharks and Mighty Ducks along the way. Many fans remember that Oilers team as a ragtag group of misfits that barely sneaked into the playoffs and pulled off a minor miracle to make it to the final, but as we’ve covered before, that’s not quite true. The Oilers actually were a pretty darn good team whose season was almost ruined by historically awful goaltending. The 2006 Oilers could score, they posted solid possession numbers (as best we can tell), and they had Chris Pronger. They also spent most of the year passing the starter’s job between Jussi Markkanen, Ty Conklin, and Mike Morrison, none of whom managed to post a save percentage better than .885. That led to a gutsy trade deadline gamble, with the Oilers sending their first-round pick to the Wild for veteran Dwayne Roloson, a pending free agent. It was a risky move. The Oilers were in danger of missing the playoffs, so it was possible they were giving up a high pick for a month’s worth of regular-season work from a player who would bolt in the offseason. But it paid off beautifully, as Roloson solidified the position during the season and then played brilliantly during the playoff run. By the time they reached the final, Edmonton looked every bit like a team that could beat Carolina and earn the franchise’s first Stanley Cup since 1990. With Roloson playing well, Pronger leading the way, a cast of unlikely heroes emerging, and an entire nation largely united behind them, the Oilers had a distinct “team of destiny” feel to them. In a wild and unpredictable season, there was no better ending you could script than the Edmonton Oilers skating off with the Stanley Cup. Oiler fan here. I had to read it. Grrr Conklin! Is Marian Hossa a future Hall of Famer?